Recently, some people have been touting grass-fed beef as eliminating all the problems associated with meat, or as an equivalent alternative to going vegetarian. Don’t fall for it. Grass-fed beef is still bad for us, the environment and, of course, the cows. Let’s take a look and see what some leading veg-authors have to say on the subject and then make a few observations of our own. Environmentalist James E. McWilliams, author of Just Food, points out that grass-fed beef produces more methane, a global-warming gas more potent that carbon dioxide, than grain-fed cows do, and that large herds of grazing cattle cause enormous amounts of soil to be eroded, choking off the streams and wetlands. In choosing grass-fed beef, we trade some environmental problems in the switch and “no study I’ve seen convincingly shows that the exchange is worth it,” he says. He further warns not to translate what is being done at the more responsible, small operator “boutique level,” to the national and international scene, where problems associated with overgrazing are so common. But perhaps most importantly for the world’s hungry, even grass-fed cows are still poor converters of plants into nutrients, and in most cases, the grasslands used for grazing could more efficiently and sustainably be used for producing various crops directly for human consumption. 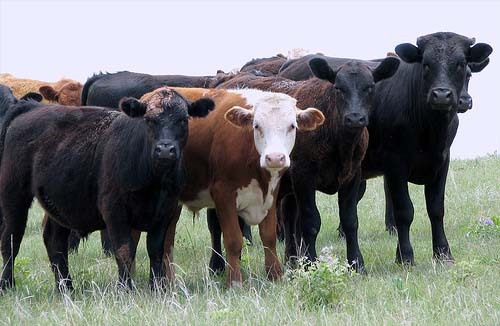 Leading author and advocate John Robbins also takes issue with grass-fed beef. While Robbins broadly agrees McWilliams’ environmental assessment and notes that “cattle grazing in the West have polluted more water, eroded more topsoil, killed more fish, displaced more wildlife, and destroyed more vegetation than any other land use.” He also takes note of some other problems not resolved by grass-fed beef, and points out that “the lives of grass-fed livestock are more humane and natural than the lives of animals confined in factory farms and feedlots, but their deaths are often just as terrifying and cruel.” Finally Robbins warns that grass-fed beef still have nutritional drawbacks associated with them, saying “I wouldn’t get too carried away and think that as long as it’s grass-fed then it’s fine and dandy. Grass-fed products are still high in saturated fat (although not as high), still high in cholesterol, and are still devoid of fiber and many other essential nutrients.” Robbins also notes that it can take up to 4 times as long to raise a grass-fed cow compared to a grain-fed one which could result in very significant shortages of supply. Dr. Richard Oppenlander, author of Comfortably Unaware, agrees with the problems associated with grass-fed beef pointed out by the others, but then goes on to point out that grazing the number of farm animals necessary to satisfy the American meat habit would require more land than the country has, and so really can’t be done anyway because it requires so much land per animal. For instance, he calculates that to raise the current number of just cows and pigs produced in the US every year would require 2.6 billion acres of land if grass-fed – an impossibility since the country only has 2.25 billion acres total land mass to begin with. Some people ask if local grass-fed beef is any better? That still doesn’t help because most of the carbon footprint is from the production of beef not its transportation. In fact, in the average household, 83% of the footprint comes just from producing the food, while transportation is just 11%. Here’s the bottom line. Grass-fed beef is still bad for the environment. And of course, even grass-fed beef still contains unhealthy amounts of heart disease promoting saturated fat and cholesterol, and even organic beef still contains cancer-causing industrial toxins that bio-concentrate in the cow over its lifetime. Almost as bad, cooking grass-fed beef still produces cancer causing HCA’s (Hetero Cyclic Amines ) and diabetes-promoting AGE’s (Advanced Glycation End-products). Plus, let’s not forget that though its raising is a little better, even grass-fed cattle still face the slaughterhouse. The best choice is still going vegetarian.